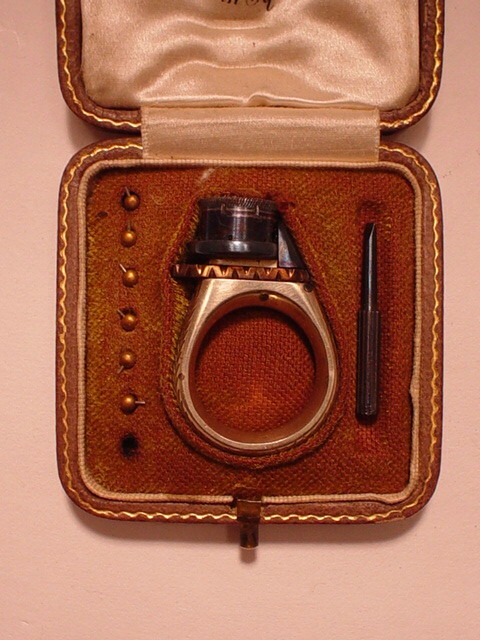 ''Femme Fatale'' Miniature Cased Ring Pinfire Revolver. 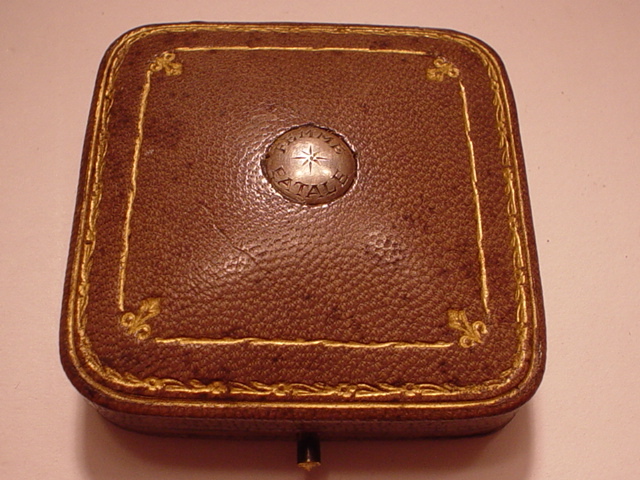 Interior of Lid Marked ''R.M. 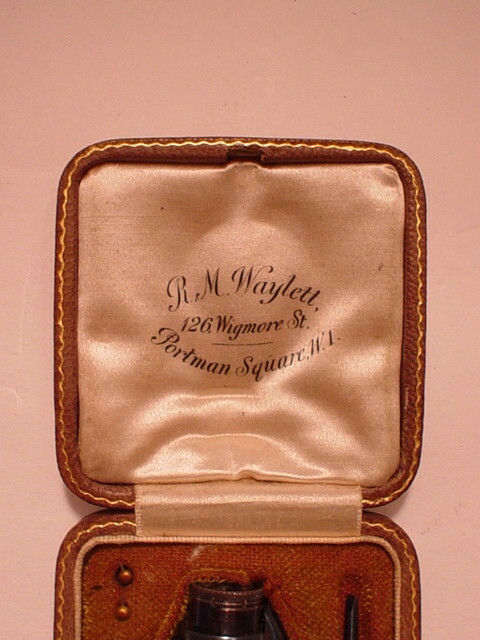 Waylett, 126, Wigmore St., Portman Square, London W.1'' c. 1870. 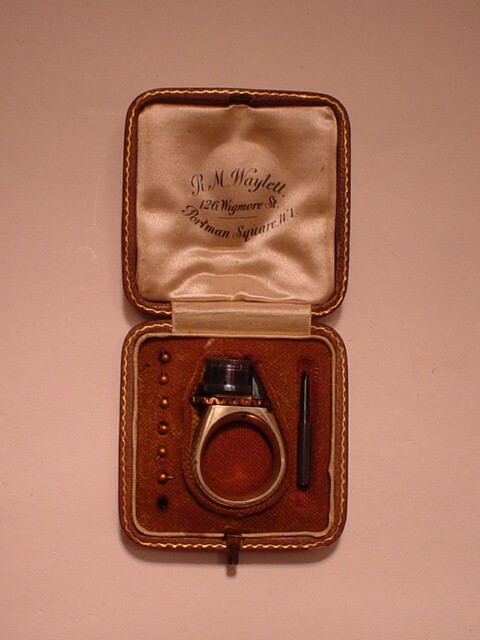 Designed to fit on the small finger, made for use by ladies, the ''Femme Fatale'' Ring Pinfire Revolver marked on ring body FEMME FATALE, and measures 1 7/16-inches in overall length; 7-shot cylinder, approximately .06 caliber pinfire; 5/6-inch long round and smoothbore cylinder, operating on pepperbox principle (without barrel); tiny hammer cocked with fingernail, tiny knurled trigger pushed inward to fire; ring of German silver; balance of parts blued steel, except for browned trigger; engraved leaf motif embellishment on 4/5 circumference of ring. 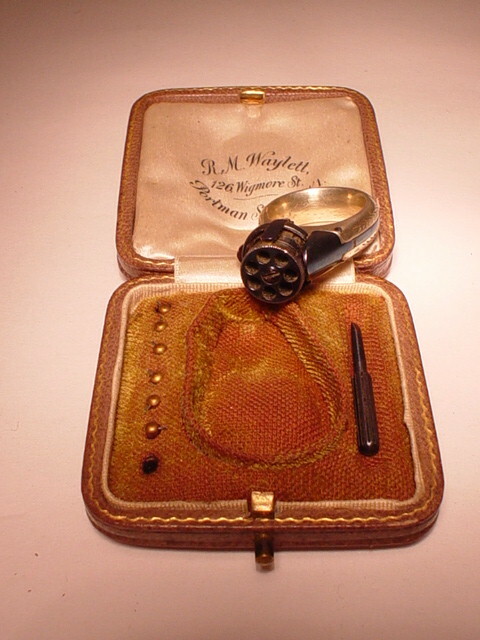 Gold embossed leather case, the top with circular German silver inlay, engraved FEMME FATALE and with star motif at center; contour lined in cloth, accommodating revolver, blued steel screwdriver, and six pinfire cartridges. Case lid secured with snap latch; cased set within red and purple cloth bag, and in pasteboard box.